Today, April 11, is the first full day of programming, and there's also a tribute to Laura Linney tonight at SFMOMA with a screening of her 2007 film The Savages, co-starring the late Philip Seymour Hoffman, for which Linney received an Oscar nomination. $30 tickets for that event are still available here. This charming looking food-focused documentary centers on a beloved figure of the Bay Area food world, cookbook author, teacher, and chef Diana Kennedy. At 95, Kennedy has solidified her position as one of the globe’s authorities on Mexican cuisine — and most recently she consulted with chef Gabriela Cámara on the opening of Cala in San Francisco. This 68-minute portrait by Elizabeth Carroll won a special jury prize for storytelling at SXSW — and Carroll is expected to attend the screening. Per the Bay Area Reporter: "As timely as today's headlines, Rachel Lears profiles a quartet of women who beat the odds and won seats in Congress, unseating well-funded male opponents. The 95-minute doc follows the 2018 campaign trail, including the upset win of Alexandria Ocasio-Cortez, the brash young woman who won New York's 14th Congressional District, which straddles working-class and middle-class hoods in the South Bronx and Northern Queens." SFFILM is paying tribute to another actress (besides Linney) who has not yet won an Oscar, the great Laura Dern. Dern will be feted on stage at the Castro Theatre Sunday, beginning with a screening of the as-yet unreleased film Trial By Fire, directed by Edward Zwick. The film co-stars Jack O'Connell as convicted arsonist and murderer of his three kids, Cameron Todd Willingham, and it's based on a 2009 New Yorker piece about a possible wrongful execution. The co-director of Beyonce's seminal companion video for the concept album "Lemonade," Joseph was a recent Artist in Residence at Headlands Center for the Arts (2018) and is a visiting artist at Stanford University. He'll be screening short works, including two new projects, and discussing "Black culture while simultaneously addressing Black people’s precarious and complicated status in society at-large." The feature directorial debut of actress Olivia Wilde centers on two high school seniors, Amy (Kaitlyn Dever) and Molly (Beanie Feldstein), who decide they didn't have a proper high school experience because they were too busy over-achieving, so they try to pack four years worth of fun into one night, on the eve of their graduation. Tuesday's screening will be attended by Wilde, as well as actors Dever, Feldstein, Nico Hiraga, and Billie Lourd. Tom Shepard’s (Scout’s Honor, 2001) new documentary profiles four refugees trying to make new lives in San Francisco: Subhi (from Syria), Junior (from Congo), and Mari and Cheyenne (from Angola). Per the festival program, "Mari and Cheyenne record an album, Subhi starts a tour speaking on behalf of Syrian refugees and finds love, while Junior faces challenges of homelessness and gender non-conformance." From the program: "Peter Lucian (Peter Sarsgaard) holds the keys to Manhattan—at least to how it sounds. He is a house tuner, hiring himself out to people who are uneasy in their apartments, but his real life’s project is mapping the city according to the note each neighborhood possesses. Unfortunately, his need for scientific recognition threatens to further ostracize him into the realm of crackpot." (The film is accompanied by a Dolby Atmos soundscape that may be best heard at the April 14 screening at Dolby Cinema, though only rush tickets will be available for that). David Gelb, the director of 2011's Jiro Dreams of Sushi and the series Chef’s Table (2015- ) brings us a new documentary tour of Asian street food. And attendees at this screening will receive a ticket that they can redeem afterward for one free meal at one of three food trucks parked nearby. 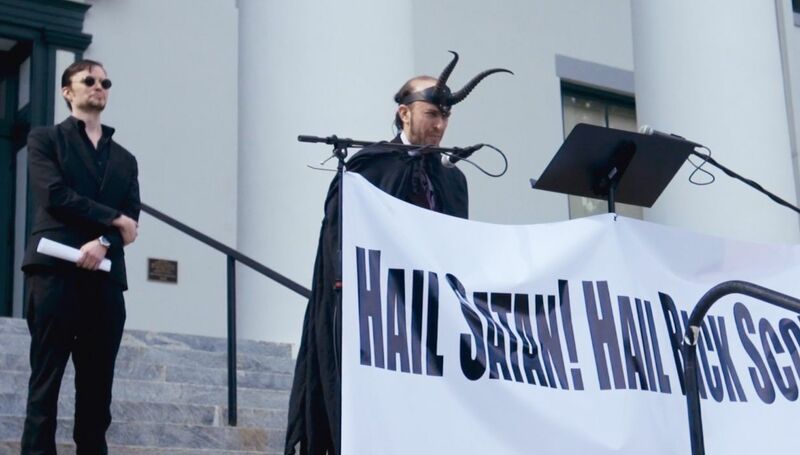 Per Variety: “Hail Satan? isn’t here to convert the audience to Lucifer — though, judging by the audience’s frequent spontaneous applause, some people may leave transformed. Like her fantastic 2013 doc Our Nixon, [director Penny] Lane sets out to subvert American history with intelligence and wit. Here, she asks us to question why certain religions are deemed ‘normal,’ even though, notes one Temple member, Catholic mass is all about the symbolic drinking of blood. But she’s also out to entertain, whether that means clips of Rosemary’s Baby and Geraldo, goofy cartoons where Uncle Sam explains the Constitution to Porky Pig, or simply observing the deadpan humor of a Temple branch who adopts a highway and stabs litter with pitchforks." Check out the full calendar and many more films to see here.